Homeaway #'s 320225, 4250743, and 320226. 4,300 square feet of home await you in this luxury rental condominium at the base of Little Cottonwood Canyon. Comfortably sleeps up to 12 people in 9 beds and includes all of the comforts of home and more. This 5 bedroom rental home features Karastan carpet, a 52' Sony Flat Screen TV, a Sony Home Entertainment system with mini Sony Surround Speakers. Hiking, biking and the incredible Alta, Snowbird, Solitude, Brighton Ski/Snowboard Resorts wait for you to partake and enjoy. After a day of activity, enjoy the ease of a casual dinner in many of the restaurants located in Cottonwood Heights, Sandy or take a short 20 minute jaunt to Downtown Salt Lake City for some of the amazing culinary offerings the city has to offer. Enter the main level either by the front door or through the attached two-car garage into a large open living area with Sony 52” Sony HDTV and gas fireplace plus the kitchen, and 2 dining rooms with seating for 6 and 8 respectively plus a half bath and 2 large balconies with spectacular views and a Weber propane grill. 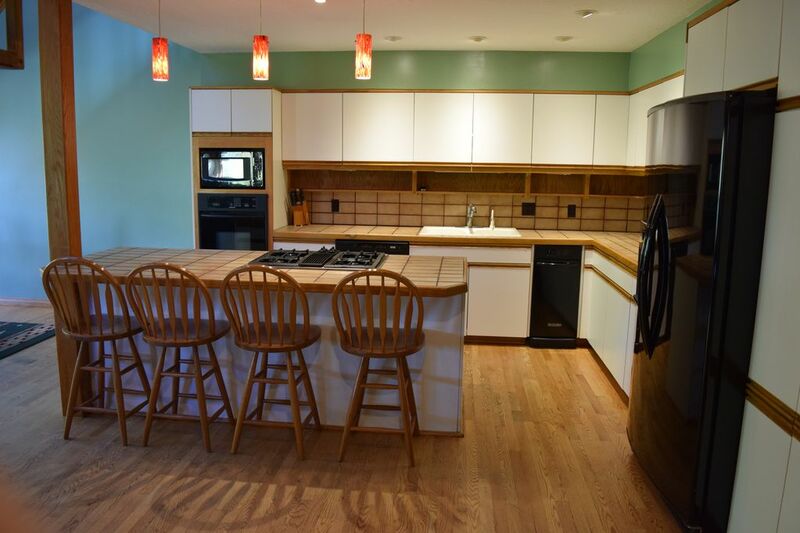 The full kitchen has a large island with seating for 4 people with KitchenAid appliances including; gas cook top, microwave oven, oven, refrigerator/freezer with ice-maker and water dispenser, dishwasher, service for 20, utensils, pots and pans, etc. The 800 square foot master suite is a getaway in itself with a king-sized bed, oversized down sofa/lounger, gas fireplace, separate bath area with two vanities, walk-in closet, enclosed toilet and bidet, a stall shower, jetted tub, dry sauna, and private balcony. Bedroom Two features a queen bed and a twin bed with a private balcony while Bedroom Three has a queen bed and a bonus room with a bunk bed. A conveniently located laundry room completes this level. Accessed by a spiral staircase, this two bedroom loft is finished in natural wood with shared full bath with jetted tub and separate stall shower. Bedroom 1 has (2) queen beds and Bedroom 2 has a king bed. Please see the notes section of my rates if your party is larger than 8 people. Satellite TV, DVD, stereo, CD player and Directv with all the movie channels and NFL ticket. Ski where you want, when you want. The Ski City pass allows you to ski a different Salt Lake City area resort each day including; Alta, Brighton, Snowbird, and Solitude. This easy-to-use card may be redeemed for an all-day lift ticket at any of the four resorts, and round-trip travel on UTA city buses, ski buses, and TRAX light-rail. The card can be loaded with one to ten days of skiing or riding. Order your Ski City pass at website listed below and the passes will be emailed to you or you can print them at home or they will be left in the condo when you check in. For vacation rentals, short-term condominium rentals, family celebrations or group activities, Altabird Rentals is your destination for a home away from home. Visit our website for more information on this condo alta approach #4. NO WAITING IN LOTS OF TRAFFIC JUST TO DRIVE TO THE BASE OF LITTLE COTTONWOOD CANYON. WE ARE LOCATED 1/4 MILE FROM THE BASE SO DRIVE TO SNOWBIRD AND ALTA IS SHORT AND HASSLE FREE. main dining room next to kitchen with 8 chairs and smaller table with 4 chairs near front door. Available upon request 5 miles from condo. Shared Hot Tub: Available upon request 5 miles from condo. This is the second time we have rented a unit from Josh and will do so again. Everything clean and in working order. Very comfortable unit with amazing sleeping capacity, as close as you can get to Snowbird and Alta and not be on the canyon road. Whole process was seamless. We just a spent a week at the condo for my niece"s weekend wedding at Snowbird. The accommodations were great and we felt very comfortable here. The great room was perfect for visiting with the family from around the country that attended, and just a short ride up to the venue. Very spacious and comfortable and well maintained. Plenty of beds. Sleeps a family of adults easily. We enjoyed our stay. Very close to Snowbird/Alta. 10 minutes. Beds are comfortable. Rooms are spacious. While the majority of the home is fairly utilitarian, the HUGE sectional in the living room is plush and a comfortable place for entire groups to hang out and relax. The sauna is a really nice added bonus to the property. Feedback to future renters, if you have a taller vehicle, mind the garage height if you have a loaded ski-rack. We didn't have any issues. If you have any guests with mobility issues on stairs, that would be a challenge since the bedrooms are either upstairs or downstairs. Awesome condo, perfect location, great owner! This unit is large but very comfortable. It sleeps more people than we had. It is clean and well maintained with every creature comfort you could want. The location is amazing. It’s perfect for families. The owner made sure every minute of our stay was perfect and he did it with a smile! Great place to stay for skiing Alta/Snowbird and Brighton/Solitude. Spacious and comfortable town home with all the amenities. Josh does a great job simplifying the rental/stay. Definitely would stay again. Leisure Activities: Boating, shopping, miniature golf, wildlife viewing. This condo is the closest rental property to Snowbird and Alta. We are 1/4 mile from the corner of Highway 209 and 210.